Ok, all.. the 250 2V is in the shop and they've taken care of just about everything.. but they want to know what kind of spring pressure I need? I dunno.. does someone know? Thanks, in advance. Re: 250 2V Spring Pressure? Use the springs that are recommended for a US 250 head/cam combo. They are basically the same head, but one of them has a removable intake. rocklord wrote: Use the springs that are recommended for a US 250 head/cam combo. I ordered them from Vintage Inlines, so they should be good to go, but my machinist wants to know, anyhow.. does anyone have a number? Maybe for stock setup or a mild cam? We used the valve retainers from a 1962 260 Ford (part number C20Z-65I4--A, 12¢ each). 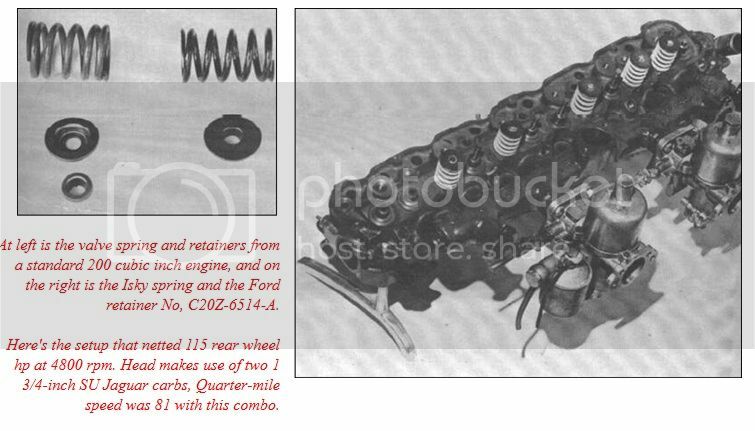 We also used the standard springs from a 289 Ford (part number B6A-6513-A, 43¢ each). Multiplying these prices by the six cylinder, you can see what we mean by a reasonable price for springs and retainers...all from your friendly Ford dealer. Ok.. looks good.. 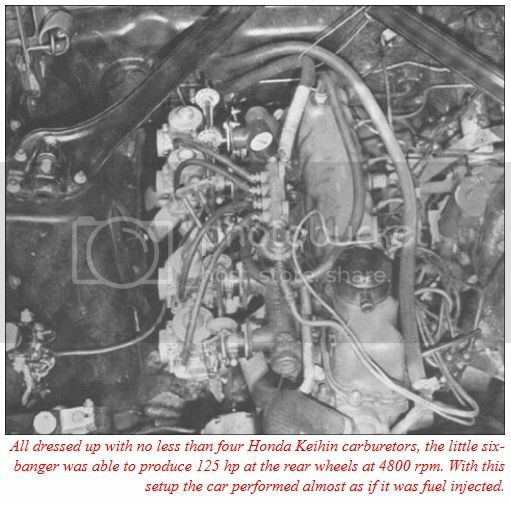 I'll pass that information on..
BTW.. out of gross curiosity... is it a relatively simple/straightforward things to change a camshaft without pulling anything else (other than the timing cover, obviously)? If it is, I might put a somewhat more aggressive cam in there..
madmaxmarchhare wrote: Ok.. looks good.. I'll pass that information on..
You need remove the rocker arms, pull the pushrods, and remove the lifters before installing a cam. The lifters will interfere with the cam installation, possibly damaging it. I'm doing a head swap right now... so most of that stuff will be out except for the lifters.. after that, just.. err.. "carefully" pull the old one out from the front and put the new one in? Any recos for an appropriate fun/interesting/mild-ish street build for a manual transmission and where I can keep the same lifters/pushrods? 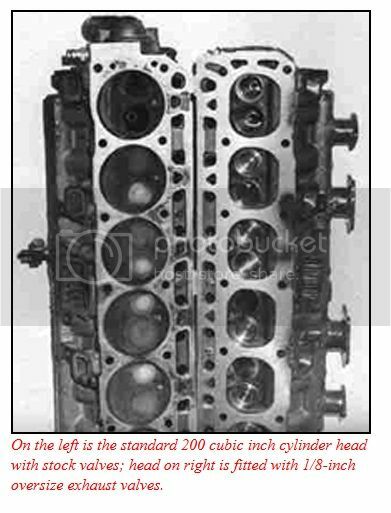 As far as the other stuff, I have a modified 250 2V head that now uses 1.75 intake valves that will go through a 38/38 carby. The rear gear ratio is whatever was standard with the Falcon XA with 3-speed column shift.. it's weak.. I want the car to have longer legs than it does.. The front will either be with this Supra 5-speed I have sitting around that was on a Falcon in Australia or I'll get a T5 here (so, yes, I have a U.S. 250 block to mate with either of those.. I'll use the Supra 5-speed if it mates properly). I just want the car to be "fun" and have somewhat longer legs than it does now.. I'm not going to drag it or chase down the Night Rider with it.. that's what Pursuit Specials are for..
That all sounds good to me! I'll let everyone know what I do when this is all done.. So.. just to be sure.. pull the lifters, and I should be able just to grab the thing by the front (not the P#$#@) and slide the camshaft outta there? Screw a long 7/16" coarse bolt in and use as a handle...The cam will hit the rods if the crank is not turned just right...There is a post that tells where a member had good luck at, can not remember where... Just rotate the crank easy back and forth and retract cam. Remember to remove the cam spacer behind the pin.it will not come on the new cam...The spacer is mostly unattainable, save the pin too but the pin can be bought...Also the inside bevel of the spacer toward the cam journal when reinstalling it. I just realized that you are using a 250 and not a 200, the interference may not bad as a 200 but now you will know to watch for it.